Built in GPS is starting to become more common with newer WM cell phones now, and everyone can get a BT GPS unit for their phone. 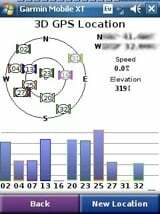 So if you want to take advantage of all this access to the satellites in the sky, then you have to decide on which GPS software program is best for you. 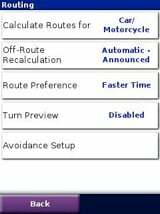 We here at WMExperts have been working our way through the most popular options (TomTom Navigator 6, OnCourse Navigator 6, Smartphone edition of Efficasoft GPS Utilities ) with detailed reviews to help make this decision a little bit easier. 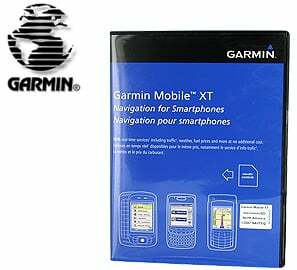 Today I am going to add one more to our ever growing collection of GPS software reviews with Garmin's Mobile XT ($99.95). I have been using GPS on my phone since I first converted to a WM phone. I am on the road a lot with my work and not having to rent a GPS unit from a rental car place for $15 a day, pay an extra $10 a month subscription for a Carrier offered GPS, or haul around an extra GPS unit every where I travel, are all huge incentives for me to always be on the look out for the best GPS software solution that I can use on my phone. In this review I will share with you how Gamin Mobile XT holds up, and as always curious minds want to know, whether I plan on keeping Garmin Mobile XT on my phone or whether I will be deleting it as soon as I finish this review. 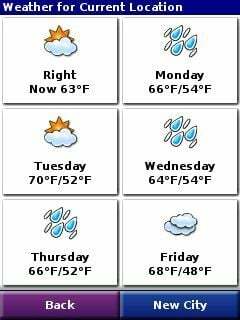 This has been by far one of the easiest installs ever with any GPS software I have tried over the past 5 years. Mobile XT comes on a 2 gb MicroSD card, and with only around 1.1 gb used, there is plenty of extra space for most users. You simply insert the MicroSD card. It automatically asks you if you want to install Mobile XT. And that's it. If you have a larger MicroSD card that you want to use, you are out of luck though. I contacted Garmin and confirmed that the program is locked to their specific SD Card. They currently do not have any plans on offering either a serial number so you can transfer it to another card or offering Mobile XT on a bigger Micro SD card. The good news is that you still around 800 mb of free space on their 2 GB MicroSD card, which should fit most users needs okay. It is important to be aware that you must have at least 12 mb of free RAM available before Mobile XT will launch after it is installed. Setting up the Mobile XT was just as easy as installing it. It automatically found my built-in GPS on my PPC-6800 with no help from me. If it cannot find the GPS, you just need to tell it what com port to look at. 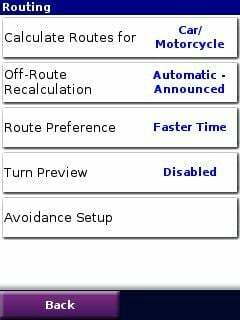 For all you PPC-6800 users out there that have to "prime" your GPS before using it, you will be very happy to know that Mobile XT works just fine without having to launch another GPS utility to jump start the GPS on the phone. Mobile XT offers all of the common options in setup, i.e. route for least amount of miles or quickest time, include carpool lanes or toll roads, etc. It does also offer a few extra settings and options that are not as common. 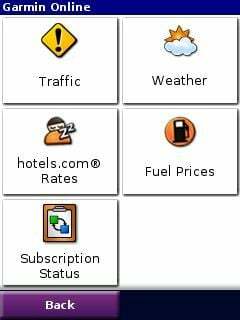 For example, you can choose if you want it calculate routes if you are driving a car, riding a bicycle, taking a taxi, driving a big truck, making deliveries, or walking. 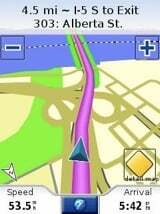 If your phone has GPS built in, many people might find themselves in several of these situations over time. There are not many settings that I found myself missing. The only one that comes to mind is not having the option to have the compass point to my destination instead of always pointing North. I find this a handy little feature at times when offered. It is nice that all of the settings are finger friendly, meaning you do not have to use a stylus to use the program or navigate the settings. 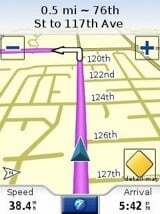 There are two aspects to look at when talking about the layout with GPS software, the navigation screen and the address entry. 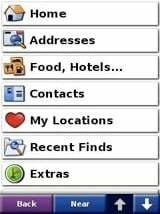 Address entry is easy to do as the buttons are big enough for the average person. The only exception might be that if someone has really large finger,s they might have to use the stylus if they use the keyboard in the program. If your phone has a physical keyboard, you can use that after you set it in the settings. Other than that, the program is very finger friendly with no need of a stylus. As for the navigation screen, it is pretty good with only a few additional features I would have like to have had included. First of all, the text is big enough to read at a glance. 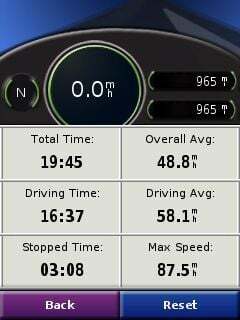 You can see how fast you are going and at what time you should be arriving at your destination. Your route is nicely highlighted for easy reference. After using TomTom Navigator 6, it was a nice and welcomed change. There are few things that would like to see added to the navigation screen. None of these are major issues, but would have been nice to have. First, at the top of the screen it says what the next street is and how far until you get there. I would like to have a turn symbol there so I know which way I have to turn no matter how far ahead it is. As it is now, you can see the turn clearly on the actual map, but only once you get close enough for it to appear on the map ahead of you. Look at the two screenshots to see what I mean. Second, as I mentioned above, I personally like the compass pointing to my destination instead of North. And the last item is that I cannot find an easy reference to how many total remaining miles I have left in my trip. Where it shows my speed, I wish I could set it to miles left to go. Again, after using this program for quite a while, these are only minor suggestions and not major concerns in any way. As you can see from this screenshot Garmin Mobile XT does not disappoint with extra features. 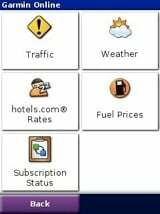 If you have a data plan on your phone and can connect to the internet, then you can get all kinds of updated information in virtually real time. 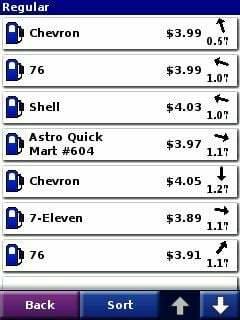 With gas prices as high as they are right now, you can have Mobile XT check all the prices for gas around you. When you pick the cheapest, then you just tap on it and have it guide you there. 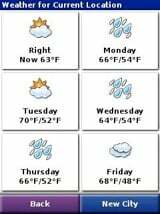 You can also get the latest weather wherever you happen to be. If you do a lot of driving for work, then there is a good chance that you need to keep track of your miles and possibly drive time. Mobile XT comes with a handy travel computer option that can track all of this each time you reset it when you get in the car. 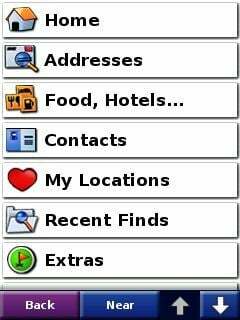 Now, no matter how good the software looks... no matter how many extra features it has... if it cannot reliably get you to where you want to go, then the rest is useless. 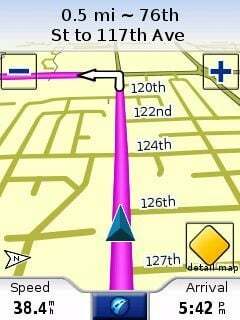 I was very impressed with Mobile XT's navigation abilities. 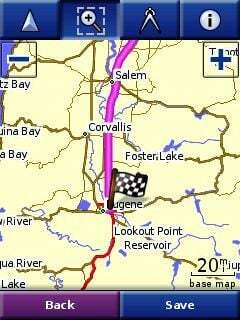 I had to use this in many remote areas in the states of OR and WA and it did a great job in getting me there. I even had to go to the same address that TomTom Navigator 6 could not find. I had to tweak the settings a little bit so that it did not try to take me the shortest way on the smallest roads, but after that, it usually chose a very logical route. 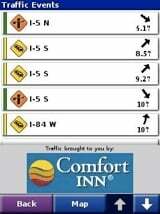 I really like the traffic / construction updates. If you look at the navigation screenshots above in the Layout section, you will see a yellow diamond shaped construction sign in the bottom right corner of the map. This means that there is either traffic congestion or construction along my given route. 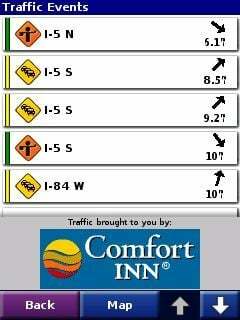 You can tap on the sign to bring up the details to help reroute yourself around anything you don't want to bother with. You can also see an overview of your route that gives you additional options in adding roads, getting additional information, etc. It did a good job at recognizing when I went off the recommended route and recalculated a new route in a respectable amount of time. The voice prompts are plenty loud and very clear and easy to understand. I seem to have noticed that the more memory my phone has free, the faster it will calculate routes and re-draw maps. I have found that its POI (Points of Interest) database is very comprehensive. 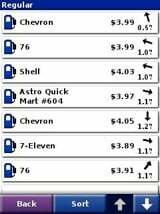 It found every hotel I was looking for, each grocery store I wanted, and even the nearest 7-11 so I could get that refreshing Slurpee on that blistering hot day! One of the biggest items I noticed missing from its navigating features is that it does not read the road names. Now even if a software package looks good on the box and works great the first couple days of using it, evaluating your opinion of it after two months of frequent use can be a totally different story. 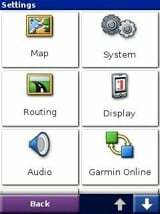 I am very pleased to say that I am just as happy with Garmin's Mobile XT ($99.95) today as when I first installed it. Until I find a better GPS software for my WM phone, I am certainly keeping this one installed, as I have used it 3 times already this week! It is easy to use, simple to setup, and fast to find the place you want to go to. Does not show direction of next turn at the top of display at all times.